Winter is going to make a comeback over the next 7-12 days at least. 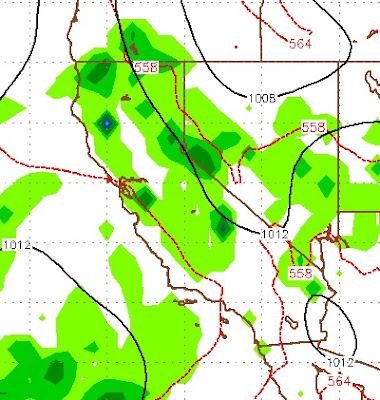 A small storm is coming in from the south and will actually deliver some much needed rainfall for Southern California. Although, I do not see a major rain event, they will take what they can get. That southern storm will work its way north into the Tahoe area and produce rain and upper elevation snow. Then, a larger storm will drop down out of the north and remind you of January around the middle of next week. This storm will bring beneficial rains to Northern California and snow to the Western Crest of the Sierra. Interestingly enough, the models are not in agreement here. The GFS is more bullish on both storms producing precip for California. The EC is has lighter amounts and later timing, but believes the Carson Range and the leeward valleys will join in on the party. I usually side with the EC as it has been the more reliable model. I believe the Carson range will pick up additional snow, although in the 3-6 range (above 8,000 feet) through the weekend. Next week is a different story. If things break our way, we could be looking at a very cold storm to bring in some very light powder around next Wednesday. This could be an April for the history books! After the weekend storm, mid next week looking like a couple nice cold lows might sneak in and give Tahoe one last blast of Winter weather!! This is very exciting stuff and interesting fact is we might get more rain this April than 2014 and 2015 Jan Feb and March combined or six months of when we get most of our precipitation!! Crazy stuff!! I've been following California weather since El Nino 1977-78 (I was 12 then) and this is "the" most "odd" El Nino in modern times !! British Columbia and Washington have been getting "hammered", El Nino "belongs" down here, SoCal ? This April "could" be one for the record books ! It's such an iffy ??? No this, our climate has changed, but it's not what you're hearing ? Hope that El Nino's don't fade away, this "could" be the last gasp of a warm Pacific ocean water, up North, where it's not supposed to be ? P.S. Great Information Blog ! Climate Change is a redundant phrase. Thanks for the insightful comment, the machine is too complex for our complete understanding. As long as that is the case, groups will use the weather and climate to create crisis that may or may not exist. Of course we cannot say with 100% certainty that they are wrong or right, because we just don't know and probably never will. Common sense must rule the day.